As I cut into a stack of Cotton + Steel over the weekend, it was inopportune and impulsive. 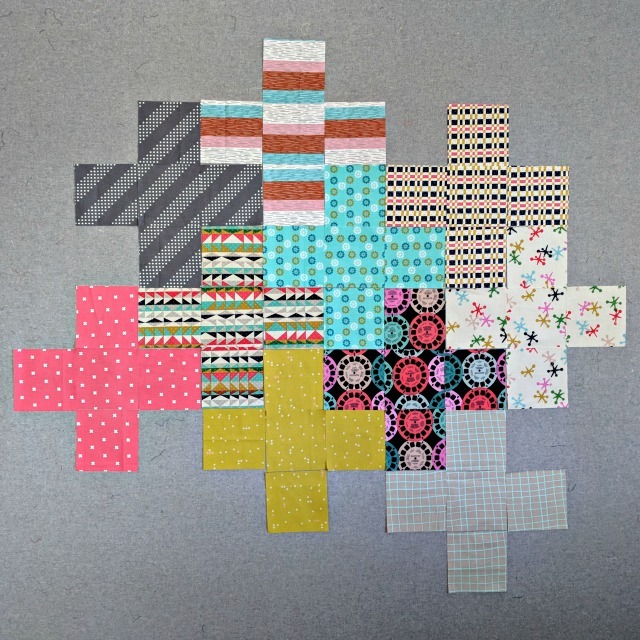 But I've had in mind to use some of my extensive C+S stash, and had finally decided it would be fun to make another giant plus quilt using Leanne/@shecanquilt's tutorial. And as I cut 5" squares and put them on the design wall, choosing both fabric and placement as I went, it dawned on me that THIS was beginning improvisation. 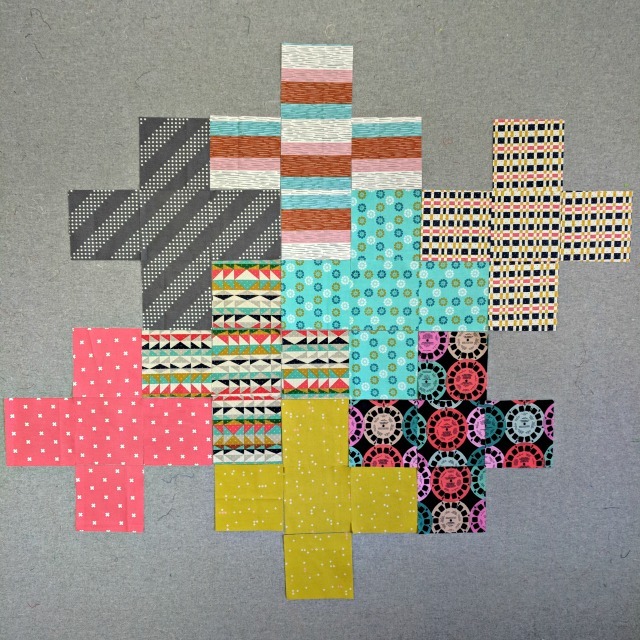 Yes, there are many techniques out there - I even have some tutorials here on the blog - that are great ways to dabble with improvisational piecing. But the crux of the matter is.... traveling outside the box. Before one ever gets to a sewing machine, there's a way of thinking, of letting loose, basically a sense of figuring it out as you go. It's not knowing where you're going but being ok with that, assuming you'll make changes along the way, and taking the risk that it won't even turn out at all. All that to say... I hear all the time that folks want to try improv, or they're afraid of improv, etc. etc. And really the first best way to test the waters is to go to the root of it all and in some small way act spontaneously. Where in this situation, I'm following a tutorial for the cutting of the squares and general design, in my fabric selection and placement, I'm totally ad-libbing, making decisions and building moment upon moment. Profound? Not really. But for those who are intrigued with improv but hesitant to try, that's where I'd suggest you start. Just risk it, be present and thoughtful, and discover as you create what comes next. That's how I quilt as much as anything. There's always some decision to be made along the way. It's empowering. 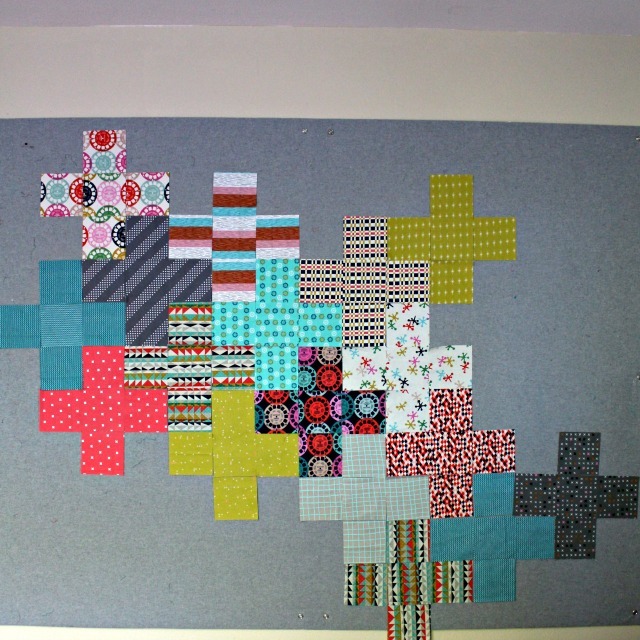 So much of life is what we have to do, what we're supposed to do--quilting is what *I want* to do and nothing else. That looks fun and something I should try - just as soon as I've got a few UFOs out of the way! I agree, be brave, take a risk . . . after all it's only quilting, it isn't skydiving, LOL. Have Fun! That's how you discover what's in you . . . be an original. Our quilting/seamstress grandmothers before us did just that years ago. I think they would've called it 'making do', trusting yourself to find a solution. It's the same idea. This is a great description of the thought processes that we all subconsciously make that are very much in line with improv. I think talking about it more in these settings can help de-mystify and make it feel much more approachable! Love you're observation. LOL, lots of also do this as we quilt but never haven attributed it to taking the first few steps toward improvisional quilting. Love you're posts.